4 toys in 1! 1. Stacking Stack cups on top of honey pot. 2. Pouring Use it in the bath for pouring play! 3. Shape Sorting Insert shapes into the holes on the honey lid. 4. Posting Post shapes and cups into pot…. 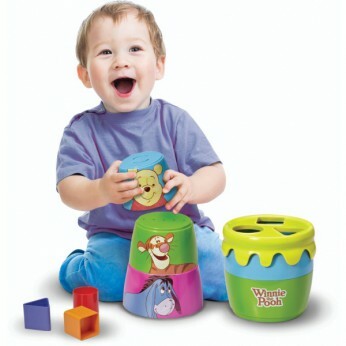 This toy costs approximately £12.99 (for the latest and best prices make sure you check our retailer list for the Winnie Stack, Pour, Post N Play above). In our review of Winnie Stack, Pour, Post N Play we classed it as being suitable for ages 3 years, 4 years, 5 years but recommend you check the manufacturer specific advice before purchasing.